WILD BEASTS: One Last Mind-Blower From The Former Mondo King – Schlockmania! Franco Prosperi had one of the more amazing and controversial careers in the history of cinema. He collaborated with Gualterio Jacopetti in the 1960’s on a string of shocking pseudo-documentaries that inspired the scandalous but popular “mondo” genre. The two also created a few neo-historical fictional shockers in the early 1970’s with Goodbye Uncle Tom and Mondo Candido. Once he and Jacopetti ended their co-directing career, he contributed to a few other mondo shockers like This Violent World. That said, his most memorable and impressive solo work was his finale as a filmmaker, the jaw-dropping “revenge of nature” opus Wild Beasts. This hybrid of animal-attack film and disaster movie is hung upon a beautiful exploitation-movie hook: when a quantity of PCP accidentally ends up in the water supply of a northern European city, it makes its way into the water system of the city’s zoo. 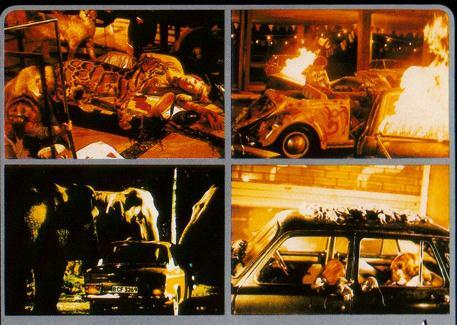 The dope-crazed animals bust out and head off in different directions as they create chaos throughout the city. It falls to zoo veterinarian Rupert (John Aldrich) and police inspector Nat Braun (Ugo Bologna) to figure out what has happened and put an end to the chao. Also involved is Rupert’s girlfriend, Laura (Lorraine De Selle), who has a daughter in a class across town to worry about. 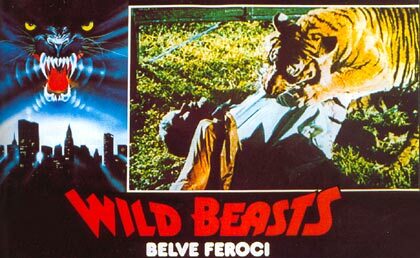 In other words, Wild Beasts is a piece of trashy horror pulp – and it goes for broke in that distinctly Italian over-the-top way. Prosperi is savvy enough to keep the plot simple and the characterizations familiar so he can maximize the amount of animal-driven mayhem on display. 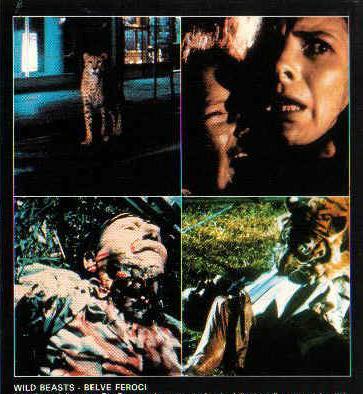 Thankfully, he gets really creative with the latter area: in addition to the expected animal-on-man attacks, there are some unique setpieces like a tiger attacking a stranded subway car full of people and a truly amazing sequence i n which a cheetah chases a woman driving a Volkswagen. Juxtapositions like those latter two examples really give this move a surrealistic charge. It also helps that Prosperi invests the project with a certain kind of b-movie delirium. It’s full of odd little details like a blind man who is recording animal sounds at the zoo to use in creating in a symphony and how Rupert manages to remain oddly chipper no matter what kind of mayhem he’s confronted with. These bits weirdness by design are juxtaposed with accidental bits of weirdness, like a police phone center where all the men have early 1980’s perms. The mixture of oddball creativity and indifference to realism often makes the movie feel like a cinematic version of the kind of animal-attack paperback novels that littered bookstore shelves in the wake of James Herbert’s The Rats (there’s even a rat attack sequence that suggests t he filmmakers were familiar with Herbert’s work). 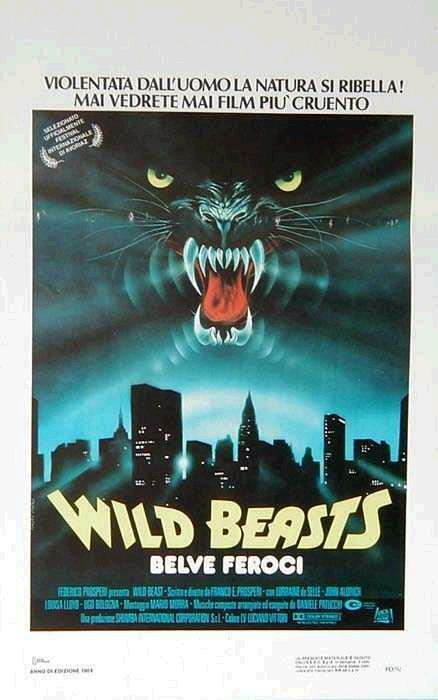 That said, the b-movie nature of Wild Beasts doesn’t mean it isn’t well-made. In fact, one of the best aspects of the film is that is reflects the sense of craftsmanship that Prosperi had picked in his career as a filmmaker. Though the special effects often reflect that Italian indifference to realism, Prosperi uses his settings (Frankfurt and Africa both served as locations) to pack in an impressive amount of production value. The majority of the setpieces were filmed on real locations, which enhance their overall effect. There are also some impressive stunts: not only the hair-raising animal-vs.-man attacks but also a few car stunt scenes with calamities that rival those of a Hal Needham movie. In a few scenes, particularly the cheetah/car chase, you won’t believe what Prosperi managed to get away with. Better yet, Prosperi and editor Mario Morra, both collaborators since the days of Mondo Cane, also use their mondo-derived style of editing to great effect here. When the animals pounce on their human prey, the frenzied, almost elliptical cutting style and ironic use of soothing music get around any dodgy effects work to give these scenes a vertiginous quality that makes them as unnerving as they are bizarre. While the attack scenes are being discussed, a warning should be offered to prospective viewers: as is often the case in Italian genre fare with animals, there are also a few queasy moments of animals actually attacking other animals. These scenes are mercifully brief but if you’re bothered by that kind of thing you might want to place this film in the do-not-watch pile alongside all those Italian cannibal flicks. That said, if you can get past the queasy mondo elements of Wild Beasts, it’s a true mindblower in the vintage exploitation film sense of the world. Love it or revile it, one viewing of this film will reveal that Prosperi ended his directing career in a manner as outrageous as it began.